Story: Family dynamics between an old couple, their daughter, and the son of her husband-to-be change when everyone visits during a summer at the family cabin. Review: The cinematography in this movie is absolutely phenomenal: indoor, outdoor, and nature photography that positively paints with light. Although all the actors are consummate professionals, and excellent actors in general, I don’t think they were right for the parts they played. 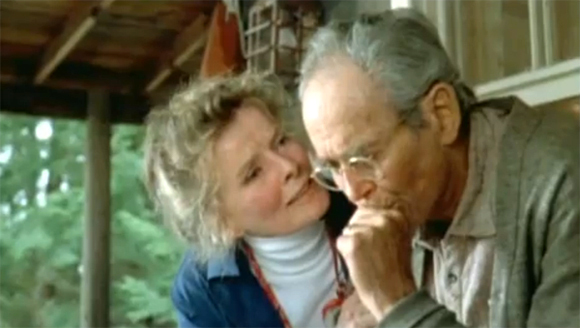 Henry Fonda and Katherine Hepburn feel too much like they’re officially playing the curmudgeon fuddy duddy types and are pretty much only genuine in short bursts with the other characters. About as close as Hepburn can get to this kind of part is the one she played in Guess Who’s Coming to Dinner. Both of them seem like the kind of old folks who stay sharp as tacks and have a tough time acting any other way believably. Nonetheless, they were all enjoyable to watch. The ending resolution between the Fondas felt like it came a bit too easily, but the fact that they really were father and daughter in real life makes it interesting enough to watch their acting in the key scene so that I can forgive the theatrical writing. Content notes: (PG) – A tiny amount of swearing and arguing, but nothing particularly offensive. This entry was posted in Review and tagged acting, Cinematography, Critical Analysis, film, industry, movie, movie review, Movies, remake, Screenwriting. Bookmark the permalink.